Some years ago I wrote a novel set within the world of Kathakali titled Mistress. The theme was art but when I am asked what my vision for the book was, I think of a piece of sculpture that I was given to commemorate its publication. 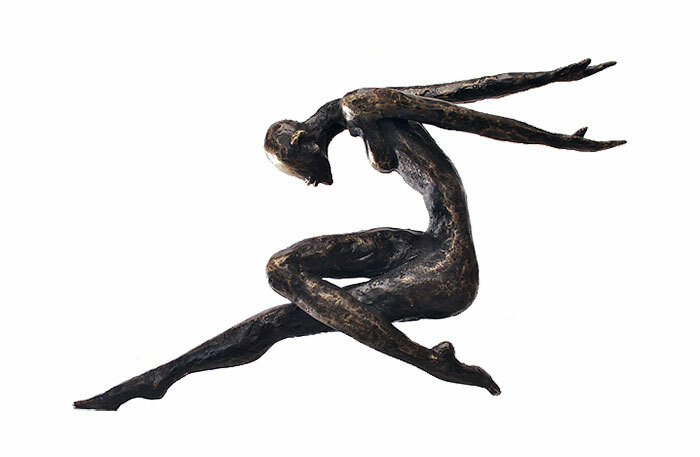 A bronze woman standing on her toes, reaching for the skies. It was a salute of camaraderie from one artist to another. More importantly, it emphasised the essence of that book, namely, artistic integrity. Ever since then, when I am troubled by trying to define artistic peripheries or artistic limits, I look at that sculpture. What speaks to me is that strength of striving that is so inherent in that form. A sculpture created by Dimpy Menon. To enter Dimpy Menon’s world, there is no need for an introduction. There is no ‘take my hand and I will lead you through what I see and how I feel’. Here is an artist who shapes like the ancients did the literature of the form. In the beginning is a thought. A rogue thought that shrugs off the commonplace and waits. There will arrive a moment when it will be allowed to inhabit a form. Elsewhere there is a slow amalgamation of copper, tin, zinc, phosphorus and sometimes small amounts of other elements. Bronze too waits. The thought finds itself fashioned in clay. A flexible mould that captures every detail of that vagrant thought. And yet, the thought isn’t complete. Wax shells the thought. Now it is the turn of the wax to wait. Call it divine ordination that says every grain of bronze has the name of the sculptor and the body of the thought cast into it. Call it sheer coincidence that a thought and a mass of alloy come together. Such is the nature of all creative process. Molten bronze is poured into the shell, displacing the wax. Later the shell is broken and the sculptor now will not let the embodied thought alone. It is teased and laboured over; it is coaxed and cajoled slowly until the thought has a structure. A tautness. A dynamic energy. A heart. A story. A holy matrimony of content and form. This then is Dimpy Menon’s world. And in Dimpy Menon’s world, there is no room for glut or even immoderation. Excess is trimmed. Extravagance curbed. It is a world that every artist hopes to create. A world of her own. Peopled by thoughts and forms that mirror each other and some more. A mother and child stand by a gate. A bird perches at the edge of the gate. Its head cocked. There is a story here. Of lessons from nature. Of a first flight. Of a shedding. Of letting go. Amongst Dimpy’s body of work are some of my particular favourites. In ‘The Engagement Picture’, a couple within individual frames face each other. There is still a reining in. A holding back. As you look at it, you wonder if this couple will ever lean into each other…. Then there is portrait of a woman in a frame. Even in the first glimpse you see that this is a woman of a certain age. Rectitude is cast into that face. The large ‘thodu’ earring echoes years and experience and you wonder how Dimpy Menon does it. Say so much with the tilt of a head, the angle of an earring; cast a vulnerability in an alloy that demands that it be heated to at least 1,700 degrees F. Before it will even let itself melt. Containing emotions. Freezing the moment. A grounding. If these symbolise Dimpy Menon’s earlier works, what we see now is an evolution. A passage that only an artist of Dimpy’s calibre will dare take. In work after work, we see how Dimpy Menon controls her art with a caution. There is passion. And there is energy but as though Dimpy Menon is bound by the laws of another of her artistic pursuits. Then you remember that in her line drawings, you have seen a hand that knows no boundaries at work. And so you understand the point Dimpy Menon has reached in her journey of self discovery. Of what she can do with her art and metal. From contained moments, we see a new volatility, a flexing, a reaching out. 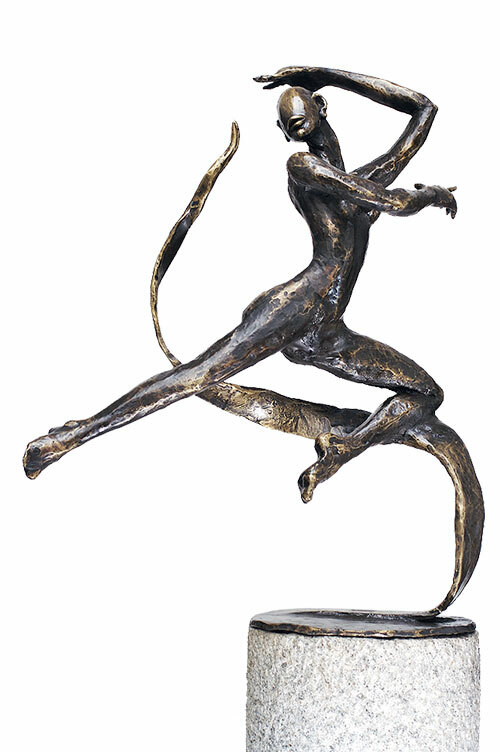 An amalgamation of her twin prowess now captured in bronze. Precision and fluidity. This is an artist who has mastered her medium. If there is tension cast into the muscle of a dancer as he leaps in the air or in the stance of a couple as they perform an arabesque in supreme co-ordination, so much so that one can envision the years of rigorous training that must have gone into the dancers’ movements, then you see how Dimpy Menon erases out all energy and mettle in another sculpture of a man wrapped around a rock. Just as one thought fear of loss could never be cast so it is with limpness of the soul, of despair and desperation…. The very nature of metal defies such trespasses. Metal is for the heroic and noble. For the grandiose and magnificent. Yet she does it again and again with an almost effortless ease. The scale of Dimpy Menon’s sculptures are seldom large. But they bear a monumentality that is testimony to the creative process that begins with a thought and ends with daunting physical labour. More than anything else, Dimpy Menon’s artistry bears within space. Caverns that let you glimpse the workings of her mind and then lets you fill it with your own. That perhaps is the greatest gift an artist can give to the world. To allow it to imbue her creation with a meaning that needn’t always be her own.